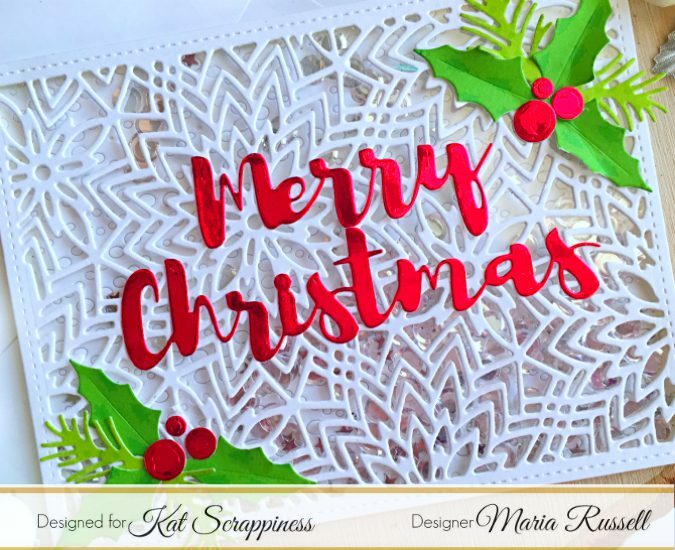 Maria here on the blog with you today! 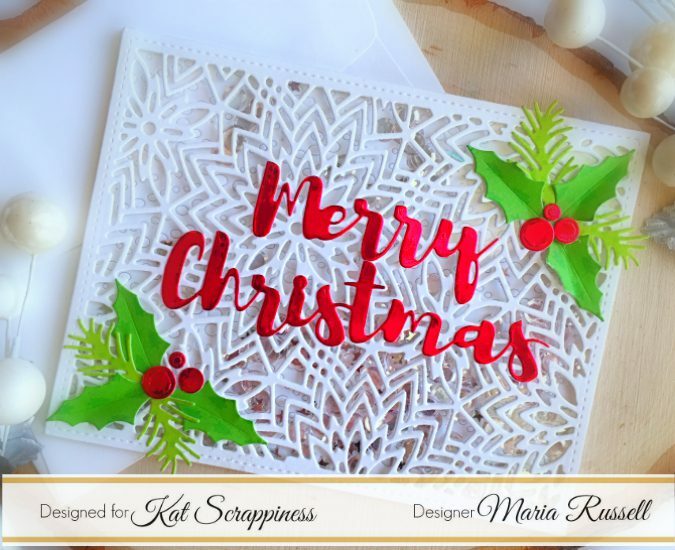 Have you checked out the new dies and jewels available now from the November release by Kat Scrappiness? They are to die for! I can’t even pick a favorite. Wait til you see the dies next month, hint, hint! They are fabulous!! You really need to save up your Christmas money for those. Or ask Santa to check out your Christmas wish list at the shop then maybe he will be good to you this year! Since my design team package got a little delayed getting to me, I am on catch up mode. I created two projects for you guys because I really wanted to show them off! For my projects today, I am featuring the Holly Leaves and Berries die set, Fancy Floral Coverplate die, Merry Critters stamp set, Avery Elle Starry Scene stamp set, 6mm Sparkling clear solid confetti, Metallic Silver Solid Star Confetti, Stitched Scalloped Border Dies and a bunch of other products available at the shop. 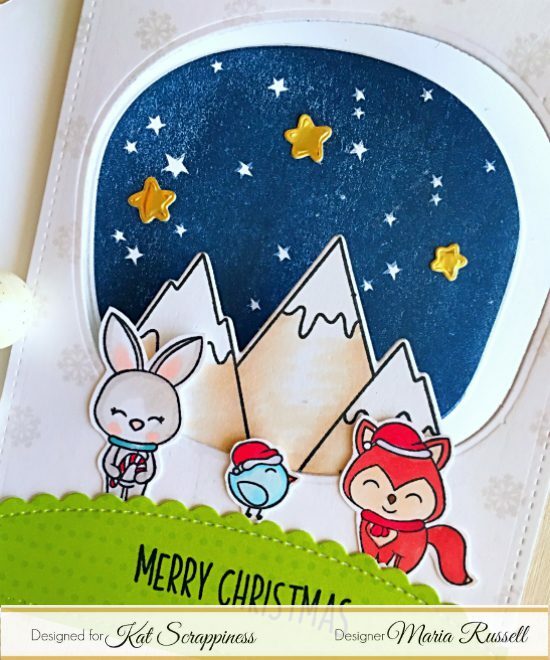 For my first card, I stamped the Merry Critters stamp set and the mountains from the Starry Scene stamp set with a Copic friendly ink and colored them in with my Copic markers. I fussy-cut the images with my scissors. 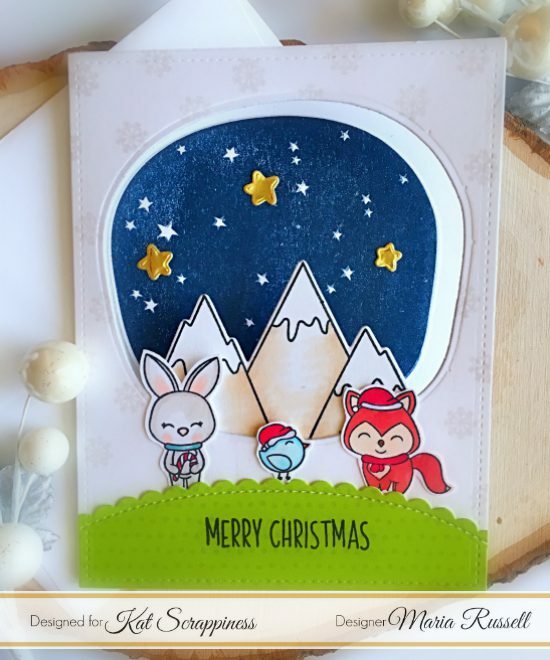 On another piece of Neenah solar white card stock, I stamped the mountains from the Avery Elle Starry Scene stamp set. I adhered this piece onto my A2 size card base. I used the coordinating die to die-cut both pieces to create the window. I adhered this piece inside my card. I also adhered the mountains inside the window. I used a patterned paper from Lawn Fawn and die-cut a piece with the Stitched Scalloped Border Dies to create my grass hill. I adhered this piece onto my foreground and added my little critters. I really love how this card turned out. The critters are so cute. That little bird reminds me of tweety so much. 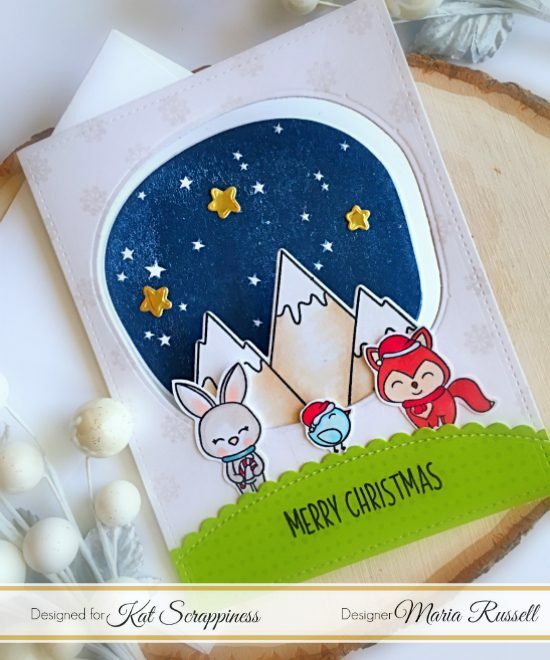 The little starry background is just the perfect size to create a beautiful scene to your cards. For my second project, I die-cut a piece of some heavy weight white card stock using the Fancy Floral Coverplate die. 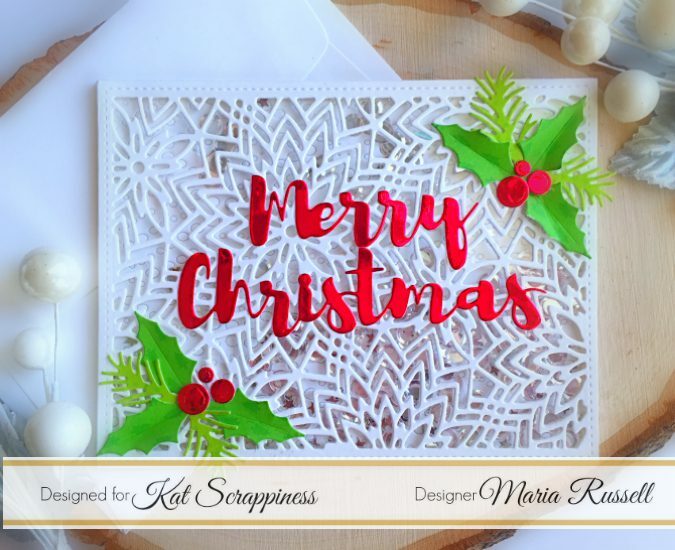 I know this die is not really meant for Christmas but I always want to share ideas on how to stretch your dies by using it for any occasion. I covered this piece with some acetate sheet and added foam adhesive to create my well. I used the 6 mm sparkling clear solid confetti with the metallic silver solid star confetti for my shaker element. I know you can barely see them in the photo but trust me, this is so pretty in real life! The holly leaves are so pretty! As I mentioned earlier, I can’t pick and choose my favorite from the November release. They are all AMAZING!!!!! I hope you like my projects today. The supplies I used are listed and linked below. I would be grateful if you can click on the links provided. By doing so, I will be getting a little commission at no cost to you! Please don’t forget to use my coupon code “MARIA10” for 10% off your order at the shop. Happy crafting!